@Gunner, sorry i didn’t get it. Can you repeat, please? AKA read that link I showed at around post #10 of this topic. I don’t know if that would be an option or solution for you or not… depends on what you want accomplish and what you try I guess. @Gunner, do you mean Image Gallery ? do you mean Image Gallery ? @Gunner, trying to change the Properties, but nothing works, still not refreshing the image and not changing any properties like scaling, rotating, etc. the problem I believe is no longer not node-red at this point. From your flow I see that the url of the image is https://192.168.0.13:1880/snapshot but blynk caches images and if the link is always the same it does not update it. A solution could be to give a unique name to the image like: https://192.168.0.13:1880/snapshot-20192103080000 simply adding the current date and time or the timestamp to filename. @gab.lau, @PeteKnight, @Gunner - thank you for your support. 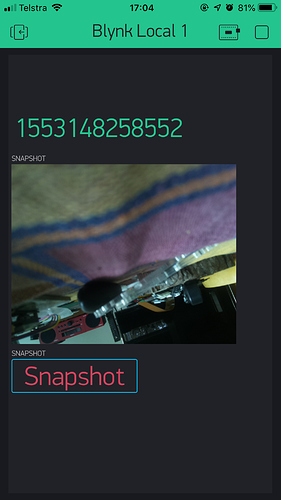 I am able to make a snapshot from RaspiCam using Blynk on Android (simulator Bluestack 4), but not on my iPhone. Is there an update for iOS in a pipeline? Are you part of the iOS beta programme? Contact @Eugene and he’ll sort you out. The link to get ios beta builds is the same and public, I’m not adding testers individually anymore.